Fendi — what is the general perfumista view of Fendi, anyway? (That's a serious question, do comment). Like many of you, I adore Theorema,1 and I know the original Fendi fragrance for women is still remembered fondly. But nothing Fendi has done in my (perfumista) time has interested me. I have nothing to say about Fan di Fendi, and the brand's last pillar for women, L'Acquarossa, did not inspire any greater sentiment than hey, you could do worse. L'Acquarossa was styled as the "red elixir of passion". Furiosa stakes its claim as "the essence of wild femininity"; in the Furiosa commercial, everything Kasia Smutniak touches takes on a glittering gold animal print to match the bottle design.2 Does it live up to its billing? Need we even ask? No, as you probably guessed there's nothing wild or furious about Furiosa, but it's quite pretty, and easily my favorite Fendi fragrance of recent times. It's a warm spicy floral, full bodied and lush — perhaps, in these days of shower-fresh / office-ready perfumes, that makes the "wild" designation fair enough? The opening is bright and slightly fruity; the pink pepper makes a good showing but does not overwhelm (the notes: bergamot, pink pepper, jasmine, matthiola incana / stock, gardenia, incense, gaïac and amber). The blended floral heart is dense, at least by modern designer perfume standards. There's a flash of gardenia, but you'll notice the stock more; as done here, it's rather like carnation minus the clove (and given current IFRA rules, that's what carnation smells like now anyway). My main complaint is that the incense and gaïac in the base could have just a little more presence. The lasting power is quite good, as is the sillage, but most of Furiosa's boldness fades in the later dry down, which is a cushy-creamy cosmetic powder with a dash of vanilla. With just a smidgen more darkness and oomph, Furiosa would have fit neatly into the Tom Ford signature line. 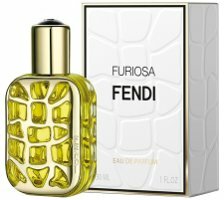 Fendi Furiosa is available in 30, 50 and 100 ml Eau de Parfum and matching body products. It is already out in some markets, including the UK and most of Europe, but I think is not expected to debut in the United States until 2015. 1. Now that perfumer Christine Nagel has joined Hermès, wouldn't it be incredible if she did some variation on Theorema under the Hermès brand name? An orange-osmanthus-cocoa Hermessence? Pretty please? 2. The bottle was done by jewelry designer Delfina Delettrez Fendi, who has her own brand but also designs pieces for the Fendi house. According to Women's Wear Daily, "Delettrez Fendi said she had drawn inspiration from Fendi’s exotic skins, and wanted the bottle to be ambiguous, possibly resembling a tortoise shell, scarab or butterfly." 3. Two suggestions from reader Rickbr, from the comments to the fragrance announcement: Furiosissima or Furiosa Nervosa. Furiosa Arrabbiato would be good too. Now that you’ve mentioned an Hermes haute version of Theorema, I’m way too distracted to think about Furiosa! It does sound pretty, though. And I like pretty. Wouldn’t that be fabulous? And now I realize that when I reviewed Jo Malone Bitter Orange & Chocolate, it was not in my mind that she developed Theorema. Which makes Bitter Orange & Chocolate all the sadder. I didn’t hate it, but it was pretty darned meh, esp. compared to Theorema. I’ll probably give it a sniff when I come across it. I haven’t had the privilege of trying Theorema, but I’d definitely be interested in a Hermessence based on it! Furiosa is worth a shot. I had some old Theorema and loved it, but a very kind person sent me another old bottle that was unopened, probably better stored (my original bottle was a tester) and smells much fresher (as in, newer) and it’s really just amazing. This actually sounds rather nice to me. Hated Fan. Liked Theorema but didn’t adore, and thank goodness did not get much chocolate or cocoa out of it, as I’ve come to understand that I generally hate that sort of thing in fragrance. My Theorema mini went off to a loving home. That bottle… ehhh. But if I run across a sample or a tester, I’ll give it a shot. Stock is wonderful. The bottle seems to be love it or hate it. I might like it but reserve the right to detest it after I see it in person…that metal finish could make it lovely or tacky. I’m glad this is worth trying, I must say I was quite nervous lol. Therefore I’ll definitely try this. Must also add that I really like the bottle. I did not think it was genius but all the same I was pleasantly surprised. They should make a Furi-ROSA! Congratulations, Robin…. I will now sniff Fendi Furiosa, when I see it in the stores. Not a fan of Fendi’s recent perfumes, and downright detest Fan di Fendi. Though, this one sounds tolerable. I do not understand Fan di Fendi. It seems to sell really well…don’t get what people see in it, but obviously, something that I’m missing. Not the first time, mind you! And L’Acquarossa didn’t do great either, despite the packaging. Their fragrances are very disappointing, they hype them up a great deal and the packaging is eye catching and all, but they are just so generic and smell like…nothing much really. I hope I will like Furiosa. Again, great packaging, I have seen real life pics of that bottle and it looks great, just like the stock pics, hopefully I’ll like the fragrance too. How funny…the parade of flankers is what made me think it must sell. I will actually be surprised if Furiosa is a huge seller. It’s more floral than I’d think whatever fan base the brand has is likely to appreciate. Also, personally, it seems to me to be a mistake to make your advertising so out of sync with the scent…the juice is not what I’d expect after seeing the ad. I Feel the EXACT Same way about Theorema… it Completely Escapes me why there is so much loved doted on this fragrance that I find Extremely Off-Putting! I have Tried, NUMEROUS, Times to smell this with the nose of those whom adore it with such unabated passion and find it totally Unpleasant smelling. Like Some Spoiled Medicine. Pallazzo was GENIUS And was a Stunningly Unique, Fan Smells great, Nothing to Shoot rockets off about, But it’s a Altogether Pretty fragrance. Now, L’Acquarossa… I bought the Second I smelled it. It’s GLORIOUS! I can’t for the LIFE of me see what all of you find so… Banal, About it. It’s a Very Sophisticated, Even Old-School Scent. I don’t Get it… I must be something of a Outcast that i don’t just go Gaga over Theorema… never Got it! I enjoyed sniffing Theorema… But wearing it was like wearing one of those orange chocolates that are wrapped in orange foil and sold at Xmas time…. Blech. I have finally realized I really do not like any gourmand perfumes…not even vanillas when they smell like pastry… But I digress! No idea what the Fendis you mention smell like, but thanks for singing a different song! It’s glad to hear (read) that Fendi has offered a better creation and worth testing out. However I still am trying to get over the fact that the “modern” fierce or bold fragrance doesn’t contain a quarter of the oomph we find in older classics, let alone the thought of creating presence. It seems to me that anything these days with a sprinkle of pink pepper is immediately tagged “wild”. Baffled. It’s puzzling, and as I said above, I do wonder if it hurts rather than helps sales to try to position a fragrance in a way that doesn’t match the juice. They should have gone for romantic or classy instead of wild. I love the scent of stock and it’s not in many perfumes (at least new perfumes; I don’t know how common it was in the past), so I definitely want to try this. It is in Milk of Flowers, which I have and enjoy. I wonder if stock as a (natural) fragrance note really exists, or if this is just another fantasy note or synthetic molecule. I have no idea. Oh, I love stock, too. Where I live common stock is a short-lived annual and needs cool temperatures. By the time the ground is unfrozen and workable in the spring and the stock plants are available, the ‘cool’ season is so short-lived that’s it’s hardly worth the planting time. I used to plant this and the night-blooming stock outside my screened porch for fragrance but the summers just got too hot too quickly. Now I get my night-scented fix from the old-fashioned nicotianas that bloom midsummer and last until frost (and conveniently self-seed). Who makes Milk of Flowers? Pretty name, and if it has a stock note, I’d be interested. That one is Geo F Trumper. For the most part I can overlook ingredient bans and budget cuts and current ‘demographic’ tastes catered to and take things as they come; however Fendi stuff for years have seemed so – blah, really. They’re still not anywhere near as bad as the newer Versace offerings though. Theorema, original Fendi and Asja were all pretty unique and gorgeous scents. I always found Theorema really interesting as it was and still is the only perfume I’ve smelled that has a note of true heavy sweet cream. It’d be so easy to call it a creamy orange spice scent but it’s so much more than that. For a perfume with so many distinctive and strong notes to it, it’s so incredibly smooth. I did like Versace Versence — not brilliant, but good. Plus, they’ve kept the (brilliant) Dreamer in production, whereas the whole older Fendi line is gone, gone, gone. But would totally agree w/ more recent Versace stuff. Pretty blah. Haven’t tried Theo. Would like to. This one sounds ok but not going out of my way to look for it. That bottle so reminds me of TMNT and Radiance by Brit Spears. But mostly TMNT. lol. Ack. Cannot think of TMNT, what is that?